I had entered The Marcher Audax in Shropshire organised by Andrew Seabourne and was looking forward to the challenge, until my health got the better of me again. I tested a 200km on the island and miserably failed it. As the Marcher Lord is a 3,000m climb Audax, I swapped it for the 100km ride held on the same day. Sometimes things are sent to try us, and by the time the train got booked, I was unable to get the bike on the train as well. 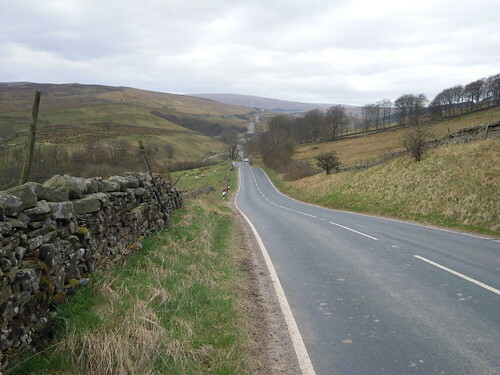 So had to cancel the ride, but unable to get my ferry fees back, I thought I would DIY GPS in Yorkshire instead, then meet eldest daughter and the pair of us cycle home, as her Easter Hols were due. 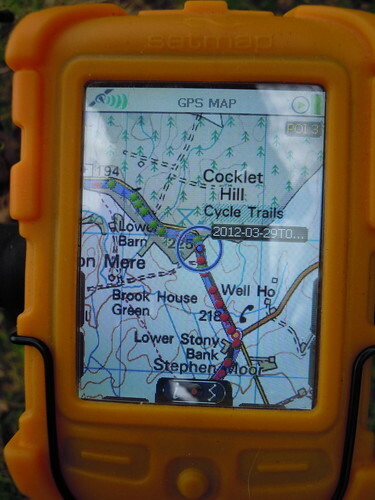 Sooo... why not DIY GPS in Yorkshire! We had had an odd March weather wise. The island peaked at 19 degrees C! Amazing, and as luck had it, although the forecast was falling, there was to be no wind, little rain and lots of sunshine the weekend I booked my DIY GPS Audax. As my eldest is now at University, and my youngest only has a year before she goes too, finances are tight. So YHA was my accommodation. Cycled from ferry through the beautiful Trough of Bowland, having scaled the dizzy heights of Jubilee Hill outside Lancaster. I was determined not to walk and although it was conquered in granny gear, myself, Enid and 28 pounds of luggage cycled up that hill! Enid taking a breather at the top of Jubilee Hill near Lancaster. Enid at the front of her stable, with pals behind. 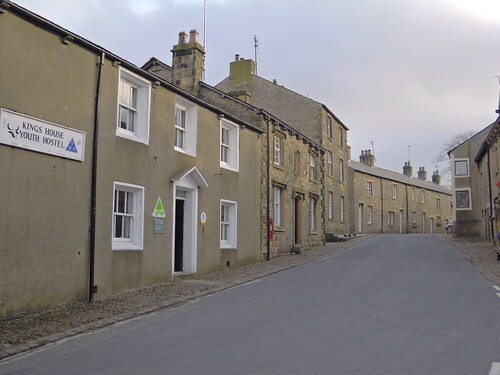 The YHA accommodation in Slaidburn of course. Oh the joys of being ORGANISED! I usually am very organised when it comes to cycling. Dunno what happened, but instead of sorting out my route to ride on the Saturday from Slaidburn, I ignored that fact, and then suddenly remembered I was doing and Audax about 2 hours on the Thursday night before the following morning ferry! Crikey, still to enter the DIY GPS Audax, I still to sort out a route..... Bike Toaster to the rescue and within 10 minutes I had a 120km route sorted with about 2.0 AAA points. SORTED. 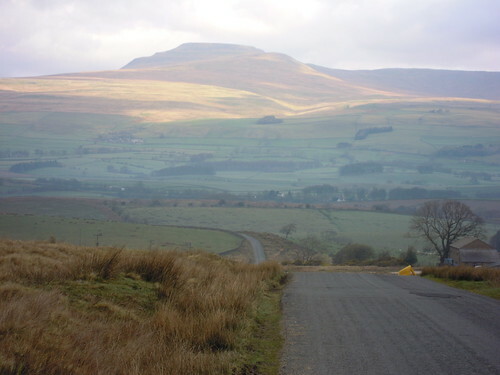 I set off nice and late from the Slaidburn residence, and my bike and I were introduced to the day of work ahead... up, up, up and up we were to cycle on Saturday. See that road between the trees? Yep, thats where I was cycling. Right through the Forest of Gisburn and out the otherside. Bike Toaster threw in some anomolies. 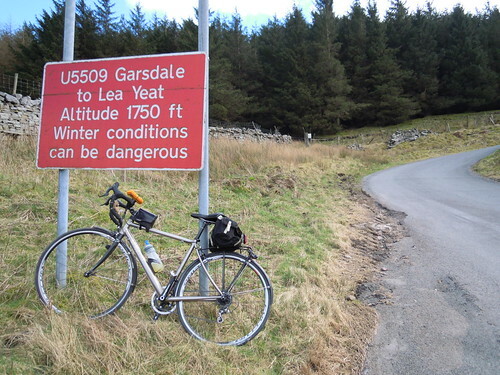 Firstly the route Bike Toaster gave me said it was worth about 2 AAA points, just short of 2,000 m of climbing. The truth was nearer 3,000. Also, and I assume its my fault is this.... Bike Toaster doesnt tell you, when you make mistakes.... and I made a BIGGIE. Thing is... I suppose Bike Toaster is ok not just for road bikes, but off roadies too... and of course SATMAP was originally designed for walkers... to put a finer point to it.. I ended up on the Pennine Bridleway! Poor Enid, she had to learn to try cyclecross, by luck her wheels are Fulcrum Racing 7, which are indeed cyclecross wheels... perhaps just as well. "I know, I know, Im not supposed to be here, Im going ok!" Finally, SATMAP advised me that the DalesWay was going to appear on my left side after the next corner of fell, and I could rejoin tarmac road to Hawes.... Phew.. One more telling off by the people in the above pic, by which time I no longer cared, and I was back on my merry way once more. Enid, on the dried up river bed, on the ford, and beneath the Dalesway access across it. Boy, it was good to be on tarmac again. Enid felt like a throughbred cut loose from the tracings of a heavy wagon, and she lept forward and we sped forth – Im not doing a ride like that ever again, I kept on muttering to her as her tyres roared their agreement on the new road surface... fabulous to be moving again. We had a lot of work still to do, and the Pennine Bridleway has wasted ages! Meant to be.... and the food was great, lots of it, hot, and proper brewed tea, and yes, a pint of cider went down nicely too. After refreshment, the ride stepped up a gear.... a lot more hills were in front of us. 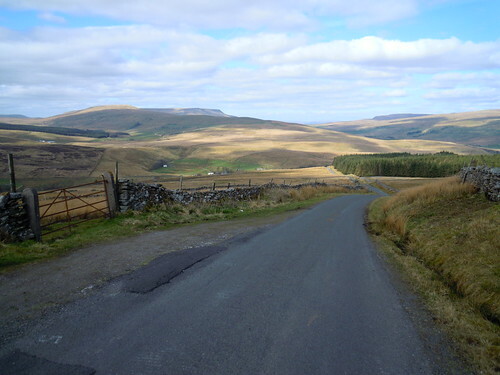 After Hawes and Hardraw, my ride was taking us to Dent, and my SATMAP said...'Go left', which worried me when I saw the road quality, incase as before, it simply ran out into dirt track. But a nice van driver assured me, it remained tarmac until Dent... 'Dont go this way lass, na, take the road ahead, its hilly is this way...' Pah I like hills... Boy he was right too. They went up, and up and up. So much so, Im sure the air was noticeably thinner up here! The road took us past Dent train station. I bet there are not too many foot passengers using it, Dent village was some distance away, and although the roads didnt give an indication of the steepness, I had to rest on the way into Dent, to cool my rims! The stink of burning rubber from my brake shoes was horrible! A nice downhill BEFORE the UP up and UP to Dent railway station. I was warned about this hill by Mr Van driver... he was right, it was mighty steep, and I walked part of it. Not quite at the top even yet.. puff, puff, puff. 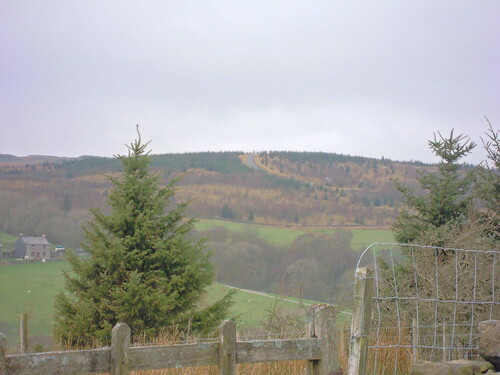 Finally, the hill peaked at its maximum rise... not far short of 635 meters above sea level! At the top, it rounded nicely to suddenly start is decent towards Dent village. Down, down Enid and I sped along, getting ever faster.... At this point in the picture, I simply had to pull to a complete stop, as my brakes were seriously over heating, I was so pleased to have replaced them the day before my trip in anticipation to hard work in the Dales, this hill would have been dangerous without new pads. Down the hill towards Dent from the Station. If you see the road streaking away into the distance, that was were I was off to next! Down, down, and further down we hurtled. Finally getting into Dent village. I really love this little place of Yorkshire. Dent is beautiful with its cobbled streets and friendly villagers. I re-loaded with carbos and water before making the meandering route to High Bentham. By this time, I had about 20ish miles left of the Audax, and I was getting tired. Tired of forever going upwards. Cross O Greet was the final hurdle before Slaidburn. Finally, at the 12 mile mark towards Slaidburn, I started to get very very tired and wishing I had a husband to call and collect me. Legs were feeling lead like, and at this point I was glad not to be doing a 200km ride in Shropshire worth 3 AAA points, I know I would not have made that ride. Finally at 6.30pm, Enid and I rolled free wheeling into Slaidburn, and back to the YHA, where once more I had the place to myself. Once Enid was tucked away, and I was washed and refreshed, I fell into bed for 8pm and fell sound asleep! Here is Enid wagging her metallic finger at me too. It was a long way back to the main road, and a long way on foot to it too! Posted by Mary on April 3rd, 2012. Fantastic! It's such a shame I couldn't do this ride with you. Then again, I may have grumbled a little on those hills............and had a few words with the opinionated walkers..............but I'm sure it would have been plenty of laughs too! Superb photos and great report Mary. 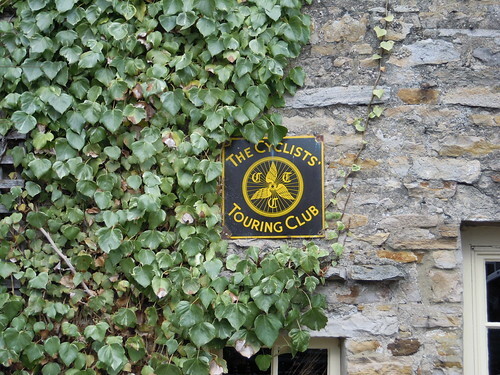 That is wonderful cycling country and I'm pleased the weather held up over the weekend. 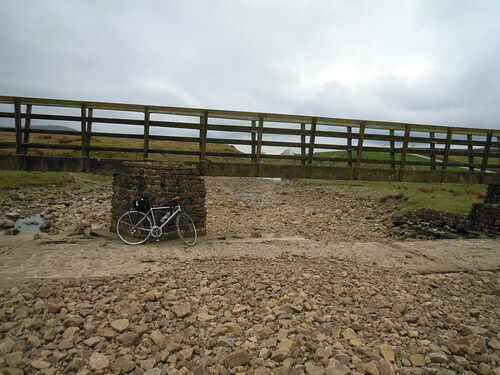 I'm not sure about the Dales Way but I think the Pennine Bridleway is eventually intended to be open to cyclists along its whole length. I really fancy cycling it but not on an out-and-out road bike. Well done! Do you know Patrick I thought it was fully ok for cyclists, its a bridleway and I always belived that in the UK bridleways were for cyclists as well as horse riders. Perhaps Im wrong. 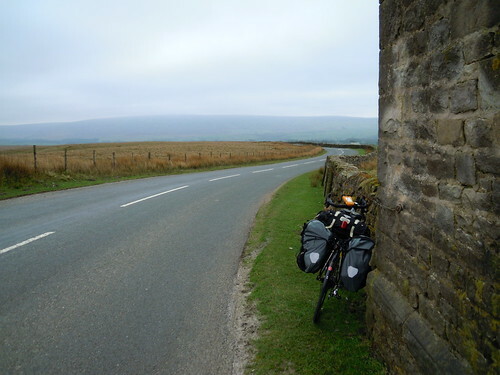 Tina and I were originally having our summer tour as a mountain bike one, and were to cycle from some where west of Liverpool and cycle up to Sedburgh via the Pennine Bridleway. The walkers were almost rude to me regarding my cycling along the trail, which was wide enough for everyone – it was just like the pic for miles and miles. 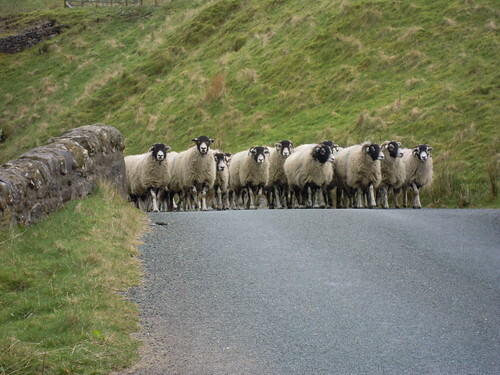 Im emailing the Pennine Bridleway online route folk today to ask them about it. I would really like to cycle the PB at some point in my cycling life. Dunno about the Garmin, but my bike computer said 10mph average, and Im getting my feedback soon from Audax UK, so Ill get a def report on speed and height points from them. 🙂 Twas a grand day out all the same. 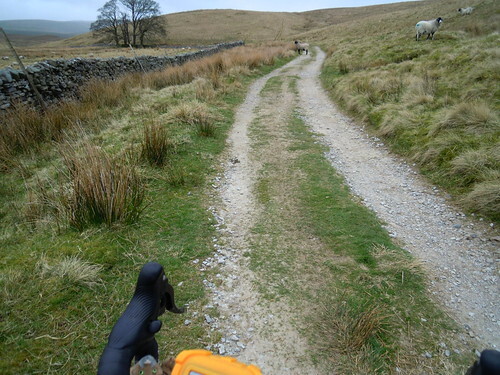 Bridleways in the UK can be used by horse riders and cyclists as well as walkers but maybe certain sections of the Pennine Bridleway have some kind of special status while they develop the route. I can't work out which bit is for what on their website but the route will eventually be 347 miles long. Superb. Walkers do tend to get uppity with cyclists. I've had the same reaction on actual bridleways and even when you stop and explain, they don't believe it. I never say anything to cyclists when I happen to be walking on a non-bridleway. As far as I'm concerned these lads are out in the open air having fun and that's enough for me. I'd be interested to see the reply to your email Mary. 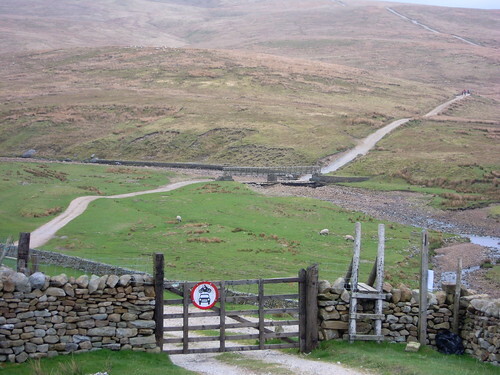 Incidentally the round sign on the gate in your "The DalesWay by bike" photo is for cars and motorcyclists, not cyclists. What a great report. It feels like being on the ride without having to do all the work 🙂 . Those bridleways are worth seeking out – I'm sure they build character. Smashing report Mary and it looks an excellent ride, if somewhat hilly! You have my sympathies for that bridleway, its bad enough having to cycle on that surface without having to put up with the moans of self righteous walkers! Great scenery though. I was pleased to read that Slaidburn YHA is still open. 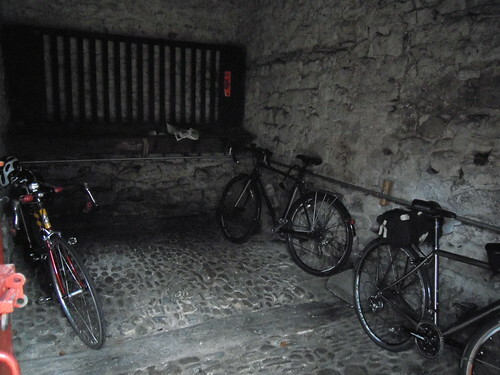 It was the first Youth Hostel I ever cycled to on my pink(!) Falcon 10 speed in 1979. I was the only woman staying then too! A grand Yorkshire day out. Dent has the highest railway station in England, so that tells us something about the climb to get there. Cracking photographs. A grand Yorkshire day out. Oh, yes, and in Lancashire as well as Yorkshire! Er, and Dent, although within the Yorkshire Dales National Park, is actually in Cumbria, isn't it? Well... it seems the Pennine Bridleway and the Pennine Way are two different things. I didn't know that until I just looked it up. Here is a map of the Pennine Bridleway (5.88 Mb PDF). 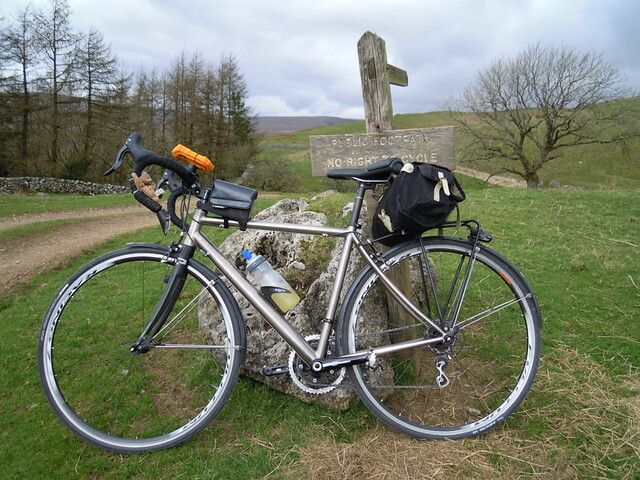 Mary, I think you cycled a short stretch of the Pennine Way (not the actual Bridleway). So that explains it I think, but a fine ride even so. 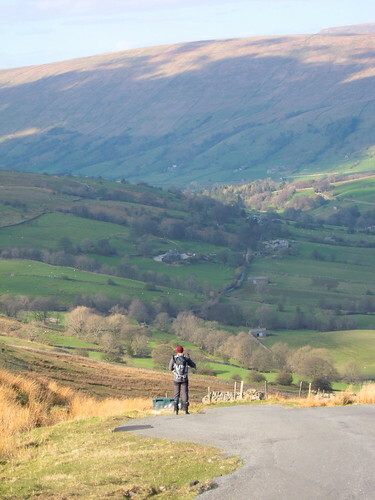 I'd very much like to cycle the Pennine Bridleway. Thank you for this Patrick, I have looked it up myself and that was the route I was accidently on that day. Its a pity at the start of the road section (must have been at least 5 hilly miles long) that there wasnt a sign suggesting the Pennine Way was the only route forward. It will be for sometime to come my very favourite place to cycle. I bet you could go down those hills very fast indeed I nearly clocked 60kmph at one point. Garmin's average moving speed is back when you click on View Details, I see. I noticed it on my Garmin Connect tracks. Mary wrote: ... one cannot cycle on a footpath in England, and I wasnt aware that there were separate routes for Bridleway vs Footpath I thought they were one and the same. They can be one and the same Mary. There are many footpaths that are also bridleways you can cycle on (or ride a horse). Of course it may well be that walkers on some bridleways are not aware that cycling is allowed, especially if the path is narrow. The definitive way to tell whether a path is also a bridleway is on the OS 1:25,000 and Landranger 1:50,000 scale maps. They are all shown with broken green or red lines and bridleways have longer dots (so to speak). It's easy to tell anyway, and I don't know of any other way to be completely sure. The whole of England is criss-crossed with bridleways but it tends to be local horse riders who use them most. As a rough guide, if a path has horse pooh on it, you can cycle on it! Info on Wikipedia about public bridleways in England and Wales. Well, do you know, I think I might have been on the Pennine Way and then the Bridleway. According to the Bridleway website, there is the same straight bit I was on. There were beautifully hung gates on this route – which I thought were a great idea when getting a horse through them while mounted (I used to ride a lot). And there were prints of cuddies along the trail too... Cant say I remember poo though. The trail was wide enough for a tractor. Thanks for the footpath/bridleway link Patrick. Anyway, Im not 100% about either now, but I wont ride it again on a road bike! 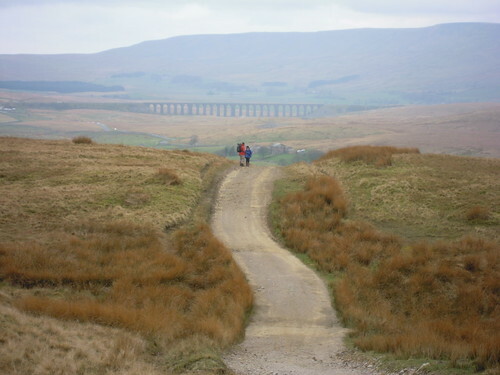 I really really fancy doing part of the Pennine Bridleway on a mtb I really do. Used to have picnics at Dent when I was little – lovely place. Great adventure Mary. Ride the trails midweek if you can, because they're deserted so you can go anywhere you like with impunity. Remember the 11th Commandment: Thou shalt not get caught.